Zardari and his sycophantic supine political party must ask themselves if he truly qualifies to be a head of state. He has five days in which to prove himself a patriot and a democrat. Democracy, no matter what the party slogan may proclaim, is not a form of revenge and for him to carry through his ambition (which he has nursed ever since he made up his mind to rid himself of Musharraf) would be an act of vengeance upon his country and its people. My advice to Asif even at this late hour is to, even now, restore the judges according to the Bhurban Declaration, remove Article 58-2(b); stand back from this election and put his weight behind an apolitical person acceptable to the PML-N. There are ways and ways to have the election postponed by a month. And therefore woo back his ‘elder’ brother to keep the Great Coalition alive. The PPP and the PML-N, hand in hand, can jointly do what no other combination can. Then just watch the dictatorship die its well-deserved and instant death. Among the number of pieces I have read in the past week, very few have been purely optimistic in their assessment of a ‘President Zardari.’ Readers of this site also voted overwhelmingly against such a development, [see previous CHUP poll]. Of the 100 people who voted in the poll, 80% felt that if Zardari was elected it would be “the worst decision for Pakistan.” Only 6% felt he deserved the position. The political power struggle that is certain to ensue between the PPP and the PML-N if a solution is not reached is troubling, to say the least. We will not be part of any conspiracy aimed at strengthening dictatorships…We want the unconditional, dignified and honorable return of the judges…We will not sit on opposition benches for the time being. 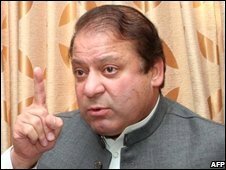 A visibly disappointed Nawaz Sharif made it clear on Saturday that if by May 12 the PPP failed to keep the promise it had made in the Bhurban Declaration on the reinstatement of judges, the PML-N would walk out of the coalition government. May 12: The New Deadline for Judiciary Restoration? CNN, in its coverage, noted, “The coalition government had vowed to reinstate the judges within 30 days of taking office — a deadline that expired Wednesday night.” The failure of the ruling parties to pass the legislation led many media outlets to speculate whether the new alliance was already cracking. 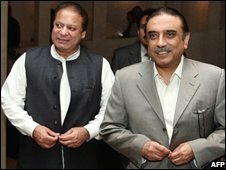 Although Nawaz emphasized the new May 12th date in his statements Friday in order to quell these rumors, Zardari reportedly “shied away” from the deadline. 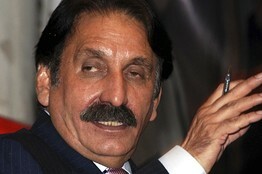 The News reported, “Talking to a private TV channel, he said only the committee assigned to reach consensus on the issue could tell whether or not the resolution on judges’ restoration could be tabled in the National Assembly by May 12.” Moreover, news sources reported that other coalition partners [the ANP and JUI-F] have to be informed of the decision, which could further complicate the issue.